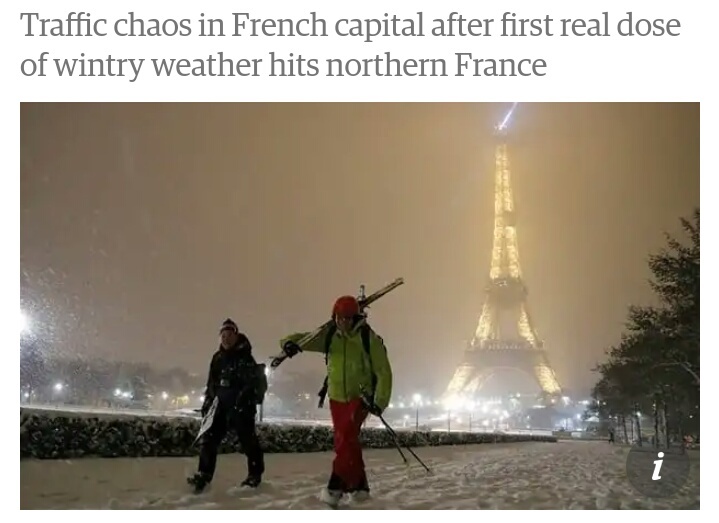 The Eiffel Tower turned away tourists on Tuesday as snow swept across northern France, causing traffic chaos in Paris during the French capital’s first real dose of wintry weather this season. The Meteo France weather service put the greater Paris region on alert for snow and black ice on roads, among 27 departments it expected to be on alert across the country until midday Wednesday. Meteo France says the snowfall will intensify overnight Wednesday, with temperatures expected to fall as low as minus 10C (14F), leaving 5-10cm (two to four inches) in most areas on alert. Snow had already dusted Paris on Monday before quickly melting away. “This will be the first blast of winter, late but the real thing, with cold air from Scandinavia colliding with a perturbation coming up from the south,” said forecaster Sebastien Leas. Rail operator SNCF had to slow down trains on several of its high-speed TGV lines, with service disrupted across much of northern France. Thousands of emergency accommodation spaces will be opened to shelter homeless people, the country’s territorial cohesion ministry said. In the Paris region, traffic was banned for vehicles weighing over 7.5 tonnes, which were told to bypass the area by police, who also advised locals limit road trips. On Tuesday night in the southern Paris suburb of Essonne, many truck drivers forced to stop on the road were preparing to spend the night. “We have been stuck since 4.30pm. We are cold, we have no food or toilet. I do not know when I will be able to leave,” one truck driver, Mehdi Benomar, told AFP. The cold snap marks a sharp contrast from the weeks of mild and rainy weather across northern France in recent weeks, prompting flooding in several areas and pushing the Seine river to more than four metres above its normal levels as it flows through the capital.